A Portland & Western locomotive crosses Jackson Street at Water Avenue. Albany has been a railroad town since 1870. Some people don’t like the sound of that. Train horns at crossings bother them. But turning the entire city into a “quiet zone” might cost in the neighborhood of $14 million. That’s the conclusion the city staff has drawn after looking into a citizen’s request to keep engineers from sounding their horns as they rumble through town. 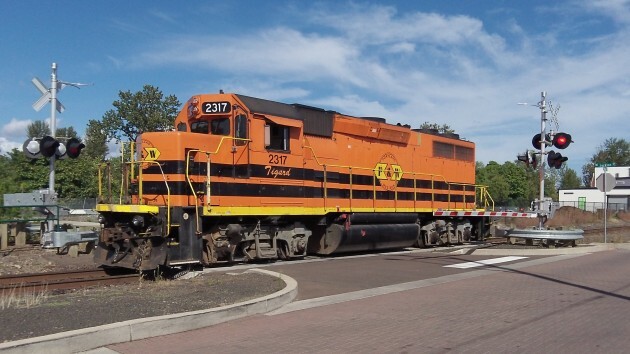 On the website of ODOT-Rail they discovered that “the train horns can be silenced only when other safety measures compensate for the absence of the horns.” They learned that new quiet zones where train horns are silenced must be at least half a mile long and every public street crossing must have flashing lights and automatic gates. But also, before communities can establish quiet zones, they must work with state and federal rail authorities to study the risk of collisions and determine what else might be required to prevent train-vehicle crashes. Possible safety measures include raised medians to keep drivers from going around the gates, and converting two-way streets to one way. As it turns out, the three railroads running in and through Albany operate up to 57 trains a day on four separate corridors, led by 26 daily freights and six passenger trains on the Union Pacific’s main line. (The total seems a little high, but that’s what it said in a memo prepared for a regional transportation plan.) There are 29 grade crossings in Albany, and then there’s Water Avenue where the old Oregon Electric line runs down the middle of the street. Flagstaff, Arizona, is also a train town, ruled by railways. The city did the quiet zone with success about five years ago. Honestly, Albany is overthinking this. State and federal safety laws do come into play, but over the long haul, it would be worth it. I live right next to the tracks, and I don’t think the Amtrak engineer who thinks holding down the horn from one end of town to the other should be allowed. One thing to be safe and sound at a crossing (which is law), but another to be excessive. And it’s the excessive noise that needs to be addressed, especially with the number of trains rolling through daily. There are many nice summer nights, when one has the windows open, and the train running through around 3AM is just LAYING ON THE HORN for extended times. It could be MUCH briefer in duration. I live about 8-10 blocks from the nearest crossing. Most nights I really don’t notice. The “bad” nights verge on criminally excessive noise! It all boils down to who is behind the controls on the engine. Pictured is the area next to Water Ave where a few blocks away the tracks head down the middle of the street. At one time rerouting this track was being looked at. Since then the section of Water Ave has the track repaired and the street replaced. Now another expense to make it quiet. Living in this area, the sounds are not the problem, safety is. A few years back there was a derailment that cut off many homes from access, most important emergency services. No homes caught fire and no one had a heart attack, but as this area has changed and is changing, it’s time to face the music: the tracks are in the wrong place. I’m with Hasso here. Some of us are close enough to the tracks to hear them whistle at night and still like the sounds. It’s loud and somehow comforting. For those who cannot abide the sounds, the tracks and trains were here first. One option would be to sell your house and move to another part of town, further from the tracks. Expecting others to shell out $14 million is unreasonable. An easy Quiet Zone? A city without non-essential car horn beeps and blasts. Cost: Zero (balancing fines with enforcement costs). Albany has grown up, there is trash and debris around the train properties leading into the rivers, the old out of date filthy trains are spewing black smoke into the air as they block intersections, the train situation needs to be addressed. These train people are not stewards of our environment or act as very good neighbors.